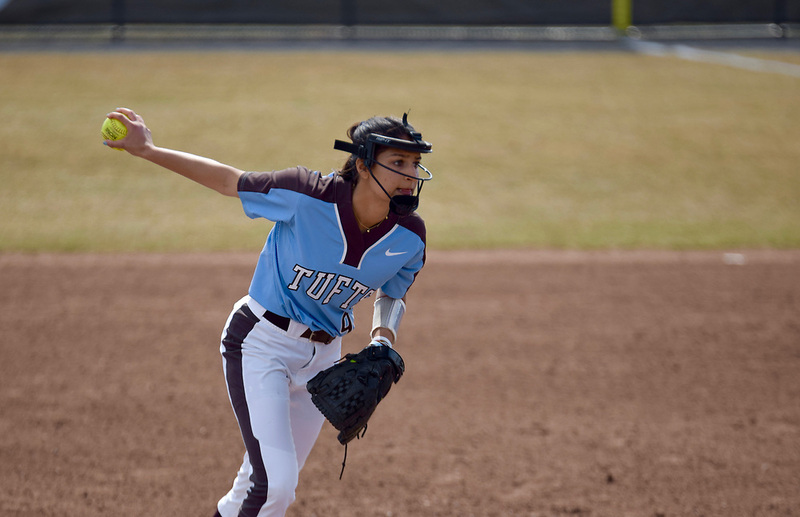 The unranked Tufts softball team (20–5) played five games over just as many days, winning three games against Babson College and conference rival Bowdoin. The team won one of two of its two-game day against crosstown rival Babson on Wednesday in Wellesley, Mass., and over the weekend, Tufts battled against Bowdoin, winning two out of three against the Polar Bears. In the first game on Wednesday, Babson won 12–4 in five innings, despite actually trailing 4–2 entering the bottom of the fifth. The Beaver offense exploded for 10 runs at the top of the fifth, rocking sophomore pitcher Kristina Haghdan and junior reliever Allison Tilton, both of whom struggled with their control. A couple defensive fielding errors and overthrows added to the massive fifth inning, as Babson ensured the Jumbos’ dynamic offense couldn’t get a chance to bat again. In the second game, however, the Jumbos’ bats and defense came alive, buoyed by yet another strong outing from sophomore starting pitcher Kristi Van Meter. Leading 2–1 at the top of the seventh, junior outfielder Maggie Lebinski came up big, knocking in an infield single and eventually rounding the bases on steals and past balls to score the Jumbos’ fifth run of the game. Van Meter led the way on the defensive side of the ball with a 135–71 pitch to strike ratio, giving up just five hits en route to her third straight complete game. Interim head coach Lauren Ebstein said she initially wanted to see her side “pitch well, hit well and play good defense for 14 innings.” Save the game-changing bottom of the fifth inning against Babson in the first game, the Jumbos allowed just four runs over 11 innings while putting up 12 hits. The two Saturday matchups against Bowdoin were supposed to take place in Brunswick, Maine, but poor field conditions forced them to relocate to Medford. The Jumbos fell 6–2 to the Bears in the first game of the doubleheader despite matching their opponents in hits with eight apiece. First-year catcher Alexis Aboulafia had a strong game, going 2–3 and batting in the Jumbos’ only two runs of the contest. Despite a good offensive showing, it was errors on the defensive end that eventually took Tufts out of the game. In the second game of the doubleheader the Jumbos checked all of its boxes, excelling in pitching, hitting and defense. The Jumbos were back their normal selves with an 8–0 thrashing of the Polar Bears. Even with a strong offensive output, it was Van Meter who stole the show, going the distance and retiring every single batter she faced. The Jumbo defense made up for its disappointing effort in the morning game by steadying the starter Van Meter as she picked apart the helpless Bowdoin lineup. The Amston, Conn. native, who now holds an 11–1 record on the year, said that facing Bowdoin the day before helped her location and her feel for the lineup, despite the strain it puts on the arm. In softball and baseball there is always an unspoken rule to not bring up a possible no-hitter or perfect game — it’s considered a serious jinx. For Van Meter, it was just about taking it batter by batter. The offense also made the feat easier by putting up five strong innings, with Lebinski leading the way with four RBIs and a home run. “The first thing I said to [the team] was ‘thank you for making that easier’ cause I only had to go five innings instead of seven,” Van Meter said. On Friday, Tufts beat Bowdoin 5–4 in the first edition of the three-day series. Sophomore Jamie Stevens was the hero, smacking a home run in the top of the seventh to set up her teams’ 18th win of the season. Meter got the win, going the distance and only allowing five hits. The game was a back and forth affair, presenting a glimpse of what appears to be a very competitive NESCAC softball division this season. Much of the Jumbos’ action of the season thus far was in Florida over spring break, where they put together an impressive 13-game win streak before falling in their finals two games. The three-game tie against Bowdoin is the second NESCAC team the Jumbos have faced this season after beating Bates three times to lead off their in-conference season. Tufts continues on in the NESCAC gauntlet this weekend, when they will face the Trinity Bantams. The first pitch is this evening at 4 p.m. at Trinity in Hartford, Conn.